1. The New Orleans cruise port is close to home for some 47 million people that live within a 500 mile radius of it, that means a short drive to and from home will get you to your cruise vacation, no need to fly or take days to drive to catch your ship. 2. New Orleans is in great proximity to points of interest throughout the Caribbean and Mexico; it is also well positioned for longer cruises that go through the Panama Canal and transatlantic journeys as well. 3. It is the base port for lots of cheap cruises, especially those Carnival cruises from New Orleans that can get you to the sun for less, an example being their Roatan, Belize and Cozumel cruise now value priced at just $409 per person. 4. Cruises leaving from New Orleans allow passengers to explore the adjoining RiverWalk shopping mall where they can shop and dine to their hearts content either before or after their cruise. 5. Whether you are taking a Norwegian cruise from New Orleans or a Carnival one, you will need somewhere to park your car. Not to worry, the port has a 4-level, 1000 vehicle parking lot that is reserved just for cruise guests at a cost of $16 per day. 6. 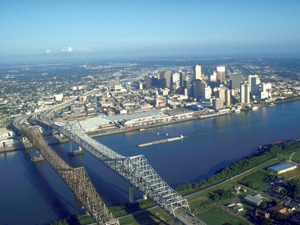 If you are flying into the city to partake in cruises leaving from New Orleans, and you want to see some of the city before you leave, you’re in luck, the port is located in the heart of downtown within walking distance of the historic French Quarter, the famous Mississippi River and many restaurants and other attractions. 7. For those on cruises departing from New Orleans, the port is easy to access and in close proximity to the airport. A great road system that is well signposted is in place and the port is also on the Riverfront Streetcar line. Cruises leaving from New Orleans do so from a port that is quickly becoming a favorite of many cruisers. Its ease of operation, plenty of parking and friendly staff ensure that your cruise vacation begins at the time you set foot in the terminal. If you are from out of town there are many hotels close by should you chose to extend your trip before or after your actual cruise.